We hear the sirens before anything else, wailing against a black screen. Emergency vehicles glide through the streets of Paris, and authority figures in riot gear patrol the streets, but nobody seems to notice. They’re shopping, eating at cafes, willfully blind that fascism is creeping up on them, more and more each day. They’re content that for the moment, at least, they’re not the target of its roundups. It’s no wonder a character eventually references George A. Romero’s Dawn of the Dead. We may think a mall is an escape, but eventually, they’ll find you there too. This is the world — a world, anyway — created in Transit, German director Christian Petzold’s slippery adaptation of Anna Seghers’s World War II-era novel. The book is set clearly in France following the German invasion, and follows an unnamed narrator as he attempts to join fellow escapees in a hectic exodus to saner pastures. Most of it takes place in the port of Marseilles, where the protagonist’s fellow refugees wait for unobtainable visas. The skeleton of Seghers’s plot still stands in Petzold’s movie, but a contemporary dermis covers most of it. Petzold, whose previous film Phoenix explored Seghers’s period more transparently, has transformed Transit into a temporal jumble of historical rhymes and repeats. Characters appear in clothing, and carry documents, suggestive of 1942, yet the cars humming down the streets could be Priuses. Our hero encounters a city map that looks up to date, yet nobody in the film has a cellphone. It could be 1944, 1984 or 2014, and maybe it’s all three of these. Petzold wants us to feel unmoored; this is a story, after all, about dislocation as a permanent state. Complicating our coherence further, the director launches into the action before we can establish our bearings, and the first 20 minutes of Transit catapult us into a story in progress. Like a viewer entering a television series on Episode 3, we catch up. This time, Seghers’s anonymous everyman has a name, Georg, and as played with laconic, brooding intensity by Franz Rogowski, there’s a good chance he’ll steal a part from Joaquin Phoenix someday. A German refugee in France, Georg is sitting at a bar when a compatriot sidles up to him with a task — to transport a writer’s transit papers and manuscript to the author himself, a controversial dissident named Weidel. Weidel, it turns out, has taken the expedient way out of an increasingly untenable situation by slitting his wrists in a hotel bathtub, leaving Georg with the man’s travel documents. For a way out, all he has to do is assume the dead writer’s identity and board a ship bound for Mexico — a clear enough form of egress that will grow murkier the longer he idles in Marseilles, haunting its consulates and cafés until his embarkation date. Supporting characters drift in and out of Georg’s consciousness like phantoms. There’s the mysterious woman in black (Paula Beer), who always seems a step behind him amid the bustle of Marseilles, frequently mistaking him for someone else and then disappearing. There’s Melissa (Maryam Zaree), the deaf-mute undocumented immigrant and wife to another dead writer, whose asthmatic son Driss (Lilien Batman) takes a shine to Georg, and vice versa. And there are the characters that seem permanently abandoned in the existential waystation of the consulate, anticipating travel approvals that are always a day away. Transit is propelled by enough bureaucratic cul-de-sacs and absurdist ironies that it’s as if a Kafka story was filmed in the slick style of late 1960s Hitchcock, to say nothing of the looming influence of Samuel Beckett — the characters are forever waiting for something that never seems to arrive. Even when they’re in vans and taxis, en route to the ship that will take them to blessed freedom, complications ensue, and they’re deposited back on the street. Even when they’re on the ship, a character impulsively runs off before it can leave the dock. Indeed, when things are looking up for Georg and his fellow refugees, we are conditioned to wait for the other shoe to drop, because said shoes drop like air-raid bombings throughout the film. Petzold’s unspecified dystopia has plenty to say about the Nazi regime, about third-world dictatorships, about today’s unfolding migrant crisis, all of them connected by a universal condition of stuckness. It’s so tragic it’s almost funny, and it’s not until the credits roll, to the perfectly chosen strains of Talking Heads’ “Road to Nowhere,” that Transit hits us for what it is — a deadpan comedy, with an emphasis on the dead. TRANSIT. 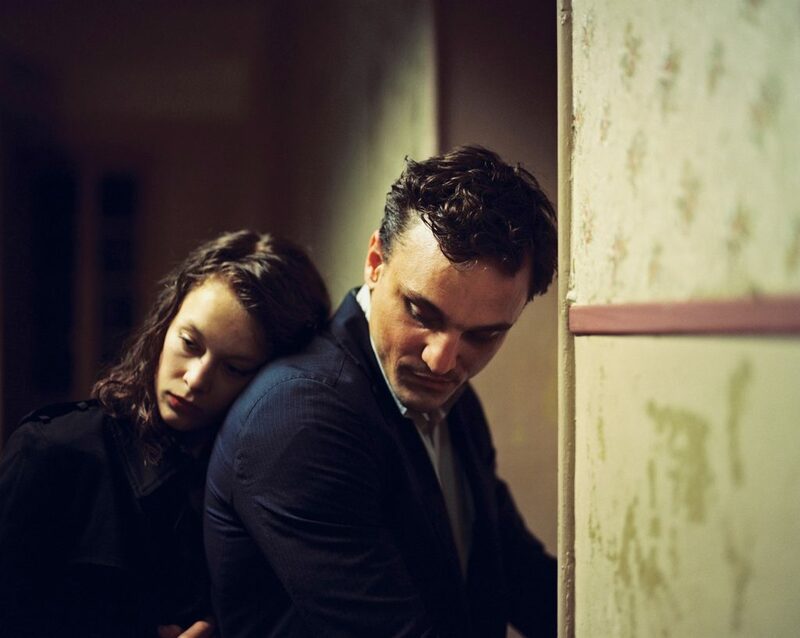 Director: Christian Petzold; Cast: Franz Rogowski, Paula Beer, Godehard Giese, Maryam Zaree, Ronald Kukulies; Distributor: Music Box; Rating: NR; in German and French with English subtitles; Opens: Friday at Living Room Theaters at FAU in Boca Raton, O Cinema in Miami Beach and Cosford Cinema in Coral Gables; and April 12 at Lake Worth Playhouse.